OmniChannel Commerce has extensive support for articles and blogs with advanced organizational, workflow, and display features that are fully integrated into the platform as a whole. For example, you can link blogs to a particular product as well as displaying them in site-wide search. As a demonstration of its versatility, the documentation you are now reading is managed within it. Each article has a number of attributes, for example: author, biographies, categories, a group, keywords, listing image, etc. 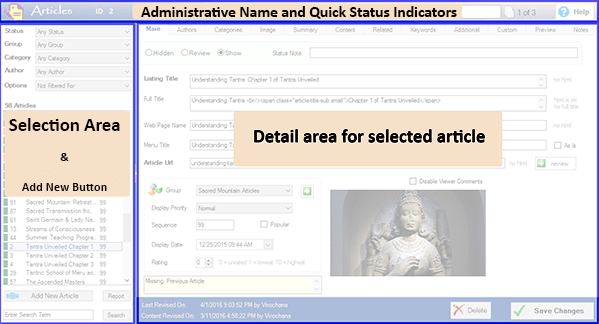 These are presented as drop-downs for the perspective field, along with a ‘Go To’ button to open its management on a separate screen tab within your administration program. Consistent with the overall patterns within OmniChannel, as you add, edit, or remove a particular attribute, the drop down list populated with them on any other open forms, either on your computer and other computers are automatically updated. 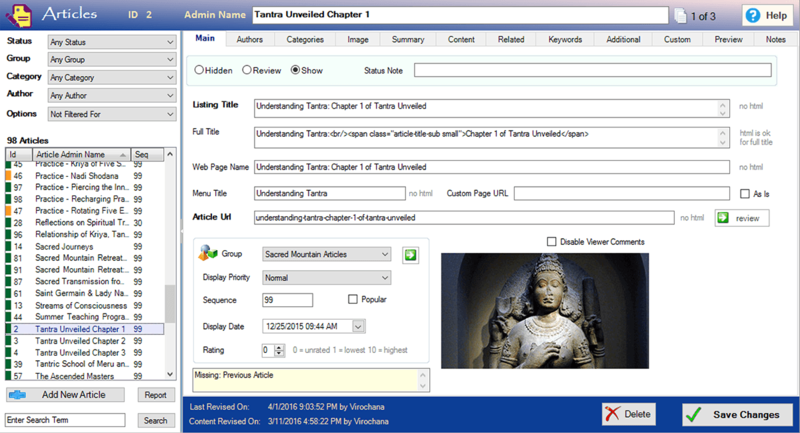 Virtual pages for article groups, categories, and authors can be produced on the fly. To open Articles Management, from your Content Management (CM) ribbon, click on the Article & Blogs icon. And here is a breakdown of the main areas: consisting of a Header, Selection, and Detail area.